Say goodbye to traditional fitness trackers. The vivomove HR is the start of a new generation smartwatch. With its feature set inherited from more expensive models, this is a smartwatch that doesn’t look smart but looks the part. The vivomove HR has some nifty tricks. First and foremost is the screen. It’s completely hidden and also doubles up as a touchscreen. It’s unusual at first to be interacting with what seems to be an analogue watch, but it’s truly natural. All you need to do to activate the screen, is to double tap on it at the bottom of the watch face (which is where the screen is located). From here you can swipe right and left to see relevant data such as steps, stress level, H.R, calories burnt and more. Pictured above is the screen in an office environment. Here you can see the watch hands being moved to 10 & 2 to accommodate the information displayed on the screen. With this innovative touch screen, you can control your phone from your wrist. The vivomove HR will allow you to answer phone calls, clear notifications and music. The most impressive feature in this package is the wrist-based H.R. To fit all of the other functionality such as the screen, Bluetooth sensors, accelerometers and of course the actual watch is impressive. Pictured above is the optical H.R profile from the vivomove HR Rose Gold. If you haven’t noticed it is super slim. 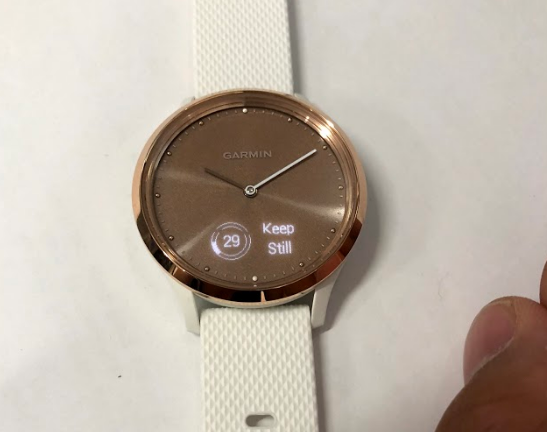 What the Garmin vivomove HR is perfect for, is for those who don’t want anything too complicated from a smartwatch or fitness tracker. It fits in as a normal watch and doesn’t take on the look of other fitness trackers often referred to as a prison bracelet. With its 24/7 tracking for pretty much everything (sleep, stress, H.R, calories, V02 max and intensity minutes) it’s a complete package as a very presentable fitness tracker. Hence the reason why we have been sold out of our stock for close to a month. This is one of our favourite products for 2017 and we anticipate it will be in high demand in the new year. The vivomove HR starts from $299 with an expected arrival of new stock between late December to mid-January. If you would like to get your hands on the Garmin vivomove HR, the quickest way is to order through our website. The post Garmin vivomove HR Review appeared first on Highly Tuned Athletes.